Hey y'all, hope your weekends were cool and all that good stuff. 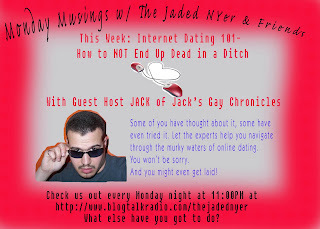 So tonight on Monday Musings w/The Jaded NYer and Friends, we're going to talk about the ins and outs of internet dating. Because we know you all secretly have profiles out there, hoping wishing praying, like us, that you'll meet that one normal person in a database filled with narcoleptic, toothless, lazy-eyed crazies. I hope to hear from you all tonight. "Operation: Kill The Beast" A Success! A bunch of things up and died in my fridge, and for a while me and the babies kept ignoring it. Until we couldn't anymore because whatever it USED TO BE dissolved into a nasty, liquidy mess that spilled all over the place, and the stench even penetrated the freezer. Now, my fridge is sparkly white and smells like clean. It makes the food in there look tons more appetizing than before! Saturday I took K to the Citywide HS Fair. At Brooklyn Tech. Wow. It was emotional for me and I didn't really think it would be. There were the staircases where JACK and I would start trouble, the cafeteria where we played spades instead of going to class, the downstairs gym with the elevated track where evil gym teachers would make ME run and run and run. ANNNNND- JACK... you'll never guess who's still teaching there... HOFTEIZER!!! I almost died when I saw his name in the directory... AAAAACK!!! Nerd girls that we are, me and the babies were playing this game to see who could name all the U.S. States based on their postal abbreviations. Both were doing pretty well, until K got stuck on WV. She could not, for the life of her figure it out. "OH! West Virginia!! No wonder I didn't get it... it's so small and insignificant..."
what will people think of my parenting skills? ?